What is the 24h Holter ECG monitoring? 1. What is the 24h Holter ECG monitoring? The continuous recording of the electrocardiogram or Holter ECG monitoring is a technique for automatic measurement of the electrical activity of the heart for 24 hours, using a miniaturized device. 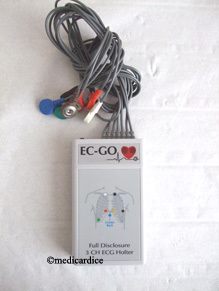 The Holter ECG monitoring device consists of electrodes connected to an electronic storage system data miniaturized. The Holter ECG monitoring device consists of electrodes connected to an miniaturized electronic storage system data . This exam allows to search for cardiac arrhythmias and to detect many cardiovascular diseases. The doctor uses this test among others to make arguments to support his diagnosis. The doctor places on the patient some electrodes connected to the device. The patient keeps the device for continuous recording for 24 hours. This exam is completely painless.